Presbyterian World Mission works in partnership with three organizations in Zambia: Church of Central Africa Presbyterian Synod of Zambia, Uniting Presbyterian Church in Southern Africa Synod of Zambia and the United Church of Zambia. Through partnership with these churches, World Mission especially seeks to build church capacity, to support training of theological students and strategic church leaders, support work in primary and secondary school education, and encourage interventions that address endemic poverty. Our mission co-workers in Zambia assist and encourage the churches in these activities. World Mission has selected Zambia as site for the Young Adult Volunteer program through which young adults 19-30 years of age are guided in discerning God’s call on their lives. If you’d like to know more about the work of World Mission in education or evangelism in Zambia, you can download and read the PDFs below. Our mission co-workers based in Zambia are Dustin and Sherri Ellington, Charles and Melissa Johnson, and Rev. Paula Cooper. In addition, mission co-workers Luta Garbat-Welch and Janet Guyer work in Zambia. Dustin serves as instructor in New Testament at Justo Mwale University, Lusaka, Zambia, where Presbyterian theological students sent by eight partners are trained. Sherri coordinates the Young Adult Volunteer program. Read more about their work here. 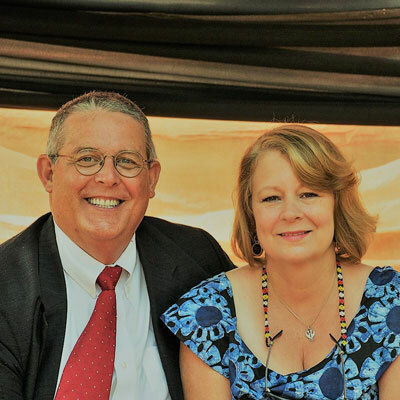 Charles and Melissa Johnson serve in team appointment with Church of Central Africa Presbyterian Zambia. As Development Specialist, Charles focuses on developing the Model Farm at Chasefu Theological College in rural eastern Zambia and teaching agriculture at Chasefu Theological College. Melissa serves with the Health Department as Facilitator for Health Education Programs. Read more about their work here. Rev. Paula Cooper serves as Regional Liaison for East Central Africa, supporting relationships with partner churches in Zambia, Malawi, Kenya, and Rwanda; facilitating partnerships with PC(USA) constituencies; supporting mission co-workers; and handling a variety of administrative responsibilities. Read more about her work here. Luta Garbat-Welch lives in Malawi and serves as Community Health Facilitator in Malawi and Zambia, where she works with Church of Central Africa Presbyterian Zambia to support implementation of Community Health Evangelism at the community level and also at Chasefu Theological College. Read more about her work here. Janet Guyer also lives in Malawi, and serves in multiple countries, including Zambia, as Facilitator for Women’s and Children’s Interests. Janet works with leaders of Church of Central Africa Presbyterian Zambia, including leaders of the Women’s Guild, as they engage in strategic planning around common concerns, explore ways of capacitating women leaders, and organize solidarity actions and other joint activities. Read more about her work here. Presbyterian World Mission works in partnership with the Church of Central Africa Presbyterian Synod of Zambia, the Uniting Presbyterian Church in Southern Africa Synod of Zambia, the United Church of Zambia, and Justo Mwale University. Church of Central Africa Presbyterian Synod of Zambia has 75,000 communicants, experiencing phenomenal growth in the 30 years since it was constituted as a synod. Much of its holistic ministry is conducted through multiple departments organized at the synod level—all of which address aspects of endemic poverty. The church’s Education Department supports 14 mission schools in rural eastern Zambia, which serve 13,800 poor rural children. The 30 community schools, 10 in Lusaka and 20 in eastern Zambia, are run by volunteers and serve approximately 5,000 orphans and vulnerable children whose family or guardians cannot afford the uniform, shoes and notebooks required by public schools. The church works to address preventative diseases in Zambia through its Community Health Evangelism program and focuses on economic insecurity through its program to organize Village Savings and Loan Associations at the grassroots level. Church of Central Africa Presbyterian Synod of Zambia especially focuses on growing Chasefu Theological College and Model Farm, sister institutions currently under development in rural eastern Zambia. Students at Chasefu complete a three-year diploma program in theological education. The theological training is supplemented by training in agriculture, community health evangelism and village savings and loan associations so the newly placed pastors are able to address physical as well as spiritual and emotional needs of church and community members. Uniting Presbyterian Church in Southern Africa Synod of Zambia was constituted as a synod in 2012 and is now working to establish formal offices, provide for a full-time synod administrator, and institute departments to address major issues confronting church and society. Many of the 35 congregations run schools that generate income to sustain ministry. Another focus is addressing the HIV/AIDS pandemic in Zambia. The women especially focus on developing Camp Deborah, located outside Lusaka, as a multipurpose center with school, poultry farm, clinic and Synod offices. The United Church of Zambia, a merger of 6 mission churches at the time of Zambian independence, is the largest Protestant church in Zambia. It has approximately 3 million members organized in over 1,000 congregations and 9 presbyteries. United Church of Zambia follows a Presbyterian style of polity. It works through multiple departments and organizations—including Mbreshi and Mwandi Hospitals and Chipembe Farm—to improve quality of life for members and Zambian citizens. Justo Mwale University (JMU), the theological institution of the Reformed Church of Zambia, relocated to Lusaka, Zambia, from Eastern Province in 1969, and in 1989 implemented a multi-church college board. At that time it opened its doors to students from the five synods of the Church of Central Africa Presbyterian, presbyteries of the Uniting Presbyterian Church of Southern Africa, and the Presbyterian Church of Mozambique. In 2013, Justo Mwale was awarded the status of a university by the Zambian Higher Education Authority. In addition to its School of Theology and Religious Studies, JMU has begun Schools of Education, Business Studies, and Humanities and Social Sciences. Through theoretical and practical learning in the School of Theology and Religious Studies, Justo Mwale University is instrumental in meeting the critical need for well-trained pastors in rapidly growing Reformed churches in southern Africa. The School of Theology offers degrees at diploma, Bachelor’s and Master’s levels. It provides a certificate program in Women’s Ministry for pastors’ spouses, and, through its Booth Center, offers certificate programs in Christian Mission, Christian Stewardship, and Sustainability for evangelists and pastors. Justo Mwale is accredited by the Accrediting Council for Theological Education in Africa (ACTEA), and is recognized by Zambian Ministry of Education. It holds multiple agreements of institutional cooperation. Join the Zambia, Zimbabwe, Mozambique Mission Network, one of more than 40 networks that connect Presbyterians who share a common mission interest. Most participants are involved in mission partnerships through congregations, presbyteries or synods. Network members come together to coordinate efforts, share best practices and develop strategies. Contact the convener Tom Sheffield at zzm.mission.network@gmail.com for the date and location of the next conference. Support a mission co-worker in Zambia. Make a contribution to any of the following mission co-workers’ ministries. To support Nancy Collins’ work, please make a gift to E200471. Congregations can designate gifts for Nancy’s Directed Mission Support to account D506149. To support Dustin and Sherri Ellington’s work, please make a gift to E200478. Congregations can designate gifts for the Ellingtons’ Directed Mission Support to account D507543. To support Charles and Melissa Johnson’s work, please make a gift to E200534. Congregations can designate gifts for the Johnsons’ Directed Mission Support to account D507589. To support the work of Luta Garbat-Welch, please make a gift to E200515. Congregations can designate gifts for Luta’s Directed Mission Support to account D507577. To support Janet Guyer’s work, please make a gift to E200351. Congregations can designate gifts for Janet’s Directed Mission Support to account D506385. Consider developing a partnership with a congregation or institution of one of the Zambian partner churches in keeping with the interest of your congregation. Experience transformation of your own congregation as you witness the incredible faith of Zambians praising God in the face of poverty, disease and death. Contact Nancy Collins at nancy.collins@pcusa.org for more information. Help alleviate poverty in Zambia by partnering with CCAP Zambia in the campaign to provide quality education for children. Help share the Good News of Jesus Christ by partnering with CCAP Zambia in the campaign to train leaders for community transformation. To help support CCAP Zambia’s efforts to train theological students in Presbyterian theology, agriculture, Community Health Evangelism, and VSLA at Chasefu, please make a gift to ECO account E052043 (CCAP Zambia General Support) and indicate “Chasefu scholarship” on the memo line of your check or in your cover letter. $2,500 covers all expenses of a Chasefu student for one year. Gifts of any size are welcome. To support community transformation through Community Health Evangelism, make a gift to ECO account E052180 (Community Health Evangelism Support for Africa). Partner with UPCSA Zambia to develop Camp Deborah by making a gift to ECO account E052141 (UPCSA Zambia General Support). Please indicate “Camp Deborah” on the memo line of your check or in your cover letter. Support theological education at Justo Mwale University. Contact Nancy Collins about providing a four-year scholarship to support a Presbyterian student at Justo Mwale. Cost averages $5,000 per year for four years. Enjoy communicating directly with your student to learn about the challenges and joys of serving churches in southern Africa. Consider a short-term mission trip to Zambia to work with the CCAP Zambia Department of Education Secretary Rev. Nehemiah Mkwayi to help with school construction or to offer a school enrichment program.